the barrel cellar at Stellakaya. Like most little girls, Ntsiki Biyela would bring pictures she had drawn at school home to her mother, who would display them proudly around the house. A few years later, it was the report cards she brought home that made her mother proud. 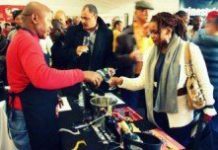 So it was only natural that when Biyela won her first gold medal from the Michelangelo International Wine Awards for a wine she made from scratch, she took a bottle from her new base in the Western Cape winelands back home to rural KwaZulu-Natal, to share with her mum. As proud as ever, Margaret Sibiya nodded and tried to smile while she told her now grown-up and successful daughter the wine was delicious. But she couldn’t quite keep from grimacing at the unfamiliar tang of a dry red wine, no matter how well rounded and smooth the Michelangelo judges had found it. That’s because Mrs Sibiya had never really tasted wine before. 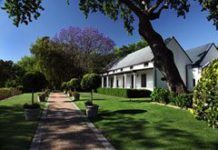 And neither had her daughter, before she arrived at the University of Stellenbosch in the Western Cape to begin her studies for a Bachelor of Science in Oenology and Viticulture. 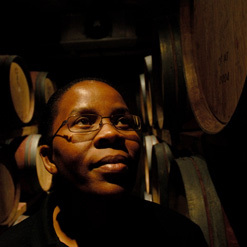 Today she is South Africa’s first black female winemaker. “I didn’t have much of an idea what viticulture was about, and I couldn’t even spell oenology,” Biyela says. A top student, she had wanted to study chemical engineering. But although she had been accepted by a number of universities, she hadn’t quite cracked a bursary. 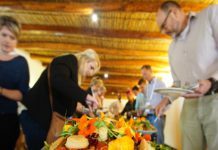 The scholarship was part of a concerted programme to change the face of South African winemaking, previously the domain of big and burly white men. 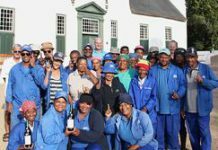 Determined to master the discipline she’d stumbled into, Biyela got a temporary job before the start of her studies at Delheim’s Cellars outside Stellenbosch, working in the wine-tasting room. Biyela seems to have a habit of jumping in the deep end. 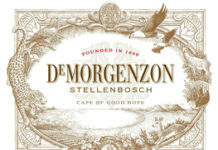 In 2004, her studies complete, she started her first real job at Stellakaya, a small boutique winery near Stellenbosch. The previous incumbent was still around and, having made all the calculations for the blending of the 2003 Boschetto, promptly went on holiday, leaving her to it – in her first week at work. “Don’t worry,” he said as he skipped out the cellar door, “you can call me any time if you need help.” Then he turned his mobile phone off, and left it off for two weeks. She quickly learned that a sincere smile and simple request for help got Stellakaya’s staff on her side. The barrels were tracked down, and big crates of bottles arrived from Consol Glass. Somehow, she got it all worked out. And then she started on the 2004 Boschetto, the first wine she made from scratch. It’s a blend of Cape Merlot, Shiraz and San Giovese, an Italian varietal. Creating the blend cost her some nerves and a few nights’ sleep, and she was relieved when the Wines and Spirits Board passed it as fit for human consumption. Biyela was on her way. The Cape Cross 2004, which was released in 2006, won her first Michelangelo gold medal. That’s the wine she took back home to her mum. 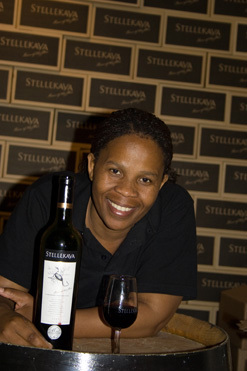 Today Biyela is the only fulltime winemaker at Stellekaya. It’s taken a while, she says, but she’s got into the rhythm of winemaking. 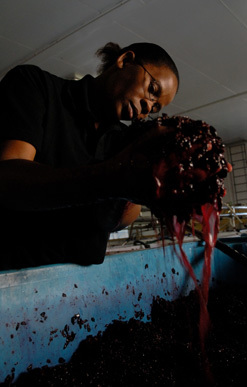 The harvest season from February to April is busy, as she supervises grape-crushing and primary fermentation. Primary fermentation takes only a few days, after which the raw wine goes into barrels for a secondary fermentation of anything from a week to a month. It is then put into new barrels, where it will mature for anything from a year to 22 months. Then comes the fun part – blending and bottling. But before she can do the blending, she has to taste each barrel, deciding which wines will best go together to achieve a particular result. Biyela is a scientist, but this part needs more art than science, more instinct than calculation. Nonetheless, it is complex and carefully thought out. As she has to sample some 500 different barrels over a period of three weeks, she bounces ideas off consultant winemaker Mark Carmichael Green throughout the tasting process. “If you do it alone you can go crazy,” she says. Biyela’s deep-end immersion wasn’t to end at with the 2004 vintage. No sooner than she had got her head above water at Stellekaya, her boss told her winemakers were required to gain experience in other winemaking regions of the world. So in 2005 he sent her off to France. There it was the northern hemisphere’s busy season – and conveniently the quiet season in the south. And she discovered that, in France, they still crush grapes by foot. On her first day she was told to put on a pair of shorts and start stomping grapes. Biyela didn’t have any shorts. Undaunted, she leapt into a huge vat of grapes wearing a T-shirt and underwear. Then tourists began to wander through. Biyela smiled sweetly and kept stomping. But the first chance she got was off to the nearest town to buy a pair of shorts. That attitude has put Biyela where she is today – a long way away from rural KwaZulu-Natal. Every wine she’s made, except one, has been awarded either four or four-and-a-half stars by South African wine guru John Platter. Her Cape Cross 2007, a Merlot, Pinotage and Cabernet Sauvignon blend, was one of six wines chosen by Wines of South Africa in a blind tasting for their Laduma Programme. 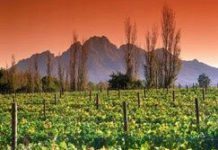 These wines will be sold under the Fundi label, with the proceeds going to training wine stewards for the expected tourism rush during the 2010 Fifa World Cup. Biyela’s not done yet. Today she is studying for a Masters in Business Administration at Stellenbosch University while working full time, and takes regular trips to discover as much as she can about making wine in different parts of the world. Her most recent trip was to California, where she visited a number of wineries to compare their New World winemaking to that back home. She didn’t press any grapes, though, because she couldn’t get a working visa. “But I took along a pair of shorts, anyhow,” she says.